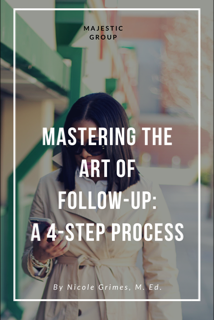 How to Master the Art of Follow-Up: A 4-Step Process by Nicole Grimes, M. Ed. It is so easy to host an initial meeting or consultation with someone. You both have shared key information and discussed the plans to move forward with all ideas discussed. When closing the meeting, both of you share next steps with intentions of following up. Somewhere along the way, you get super busy or super booked, life happens, and the intent to follow-up gets lost. As a result, you lose out on potential opportunities. To send the message that you are serious about truly providing support AND delivering results, as agreed, it is imperative to master the art of follow-up. Through the establishment of a true process for follow-up, you show that you are serious about your business, serious about establishing relationships, and you show that you are committed to both accountability and reliability. Be specific about your expectations for follow-up. Ensure that all parties involved clearly understand that follow-up will potentially occur. In doing so, outline what the next steps are while specifically stating when and how the follow-up will take place. Establish a specific time to follow-up with the person or on the task. When meeting with a potential client or key connection, it is important that all parties, including you, have access to your calendars. Take time to discuss and establish a time that works for everyone so that the follow-up can actually occur at an equitable time/date. Then actually set the time/date. Use a tool to set a clear follow-up time for all persons involved. We live a busy lifestyle, so it is quite helpful to use a tool to also support the follow-up. I choose to use an electronic tool, such as my phone calendar or Google calendar. Depending on the type of meeting that will occur, I also incorporate the use of various apps to support the process. There is nothing better than a scheduled reminder to keep everyone on task. If for whatever reason, this time doesn’t end up working (because life happens), take a few minutes to talk through establishing another time using the process discussed in Step 2. Follow-up on the follow-up. Continue the process. In my research and practice, I have learned that the key to follow-up is following up. Sounds simple, right? Once the initial follow-up has taken place, it is important to continue to revisit steps 1-3 at each checkpoint or after each meeting to truly achieve the intended results in the long run. To establish a true relationship where actual results are produced, it is important to be intentional around the follow-up process. By truly investing in The Art of Follow-Up, you show that you are serious about accountability, not only for the person you are connecting with but also for yourself as a professional. Establish a system that works for you and commit to making it routine. Before and after leaving my final full-time job, I had various side hustles to help my husband pay the bills. Some of my entrepreneurial jobs were: owning a home daycare for years (including weekend and overnight care for military families), tutoring, selling Mary Kay, Avon, and Real Estate (I did well until the bubble burst). Honestly, I did not understand how much time and commitment it would take. After numerous instances of forgetting to pick my kids up, to drop them off or to go grocery shopping, I had to find a way to manage all of this and stay engaged with my kids and husband. I had bouts where I was so overwhelmed that I would snap at everyone or eat excessively to cope. Eventually, I ballooned to almost 200lbs. I had to make a change for my emotional, mental, spiritual and physical health. Hearing my doctor say the words, “You have diabetes” before my 39th birthday was my wake up call. I was not only failing myself, I was failing my kids too. I was fatigued all the time, which caused my husband and children suffered. I was even to exhausted to give 100% to my businesses as well. In January 2011, I decided I could do both but I had to be smart about it. I started walking while my daughter was at cheer practice. On days she didn’t have practice, she would go to the track with me. This gave us time to spend together. By November that same year, I lost 53lbs and was diabetes-free before my 40th birthday. I became a better mother and entrepreneur because I put me first. I even started my nonprofit, Forever Free Books and my current purpose-filled mission, The Real Wife Movement. I know this was a direct result of implementing ways to take care of myself and my family. Being a “MOM”preneur can be stressful if you do not have systems in place. Find things that work for you and implement them. I promise, your business will thrive and your kids will thank you for giving them 100% of their mom.